So much of football is measured in numbers: star rating, height, weight, 40-yard dash time, vertical jump, average yards per game, touchdowns, interceptions, tackles for loss, sacks, etc. But can they deceive, or fail to tell the full story (especially when it comes to recruiting) when it comes to our beloved Ducks? 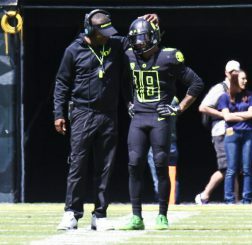 Let’s take a look today at other numbers associated with Oregon Football Recruiting, and use them to help us gauge the impact of recruiting under new coach Willie Taggart. 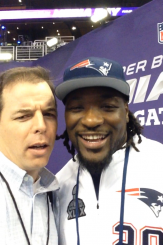 Mike Ostrom with LeGarrette Blount. I want to start by using some numbers I crunched last year for Mike Ostrom for his FishDuck.com article about the Comparative Recruiting Index (CRI). Ostrom emphasizes the ability to “coach up” the lesser rated players to get more production from them than initially expected. This requires proper player evaluation by the coaches. “Doing more with less” is how Ostrom puts it. Oregon has impressive CRI numbers. But I wanted to dig a little deeper, so I could see what history has brought us, and what I might expect in the future recruiting and the wins that ultimately determine success. What I found really blew me away — so much so that I see Oregon in a new light. The four Pac-12 teams mentioned in Ostrom’s article are the four on which I will focus, along with the reigning conference champion. Those five teams are Oregon, Stanford, UCLA, USC and Washington. I went back 10 years to see the overall win-loss record over that time. Washington has 66 wins and 64 losses in that span. Since 2011, the Huskies have lost five of the last six to Oregon. Not only that, the Ducks managed to beat Washington 11 times by 17 or more points in the last 13 years. Coach Willie Taggart cares for his players, which is the big reason for an epic spring game weekend. UCLA has had considerable recruiting success lately under head coach Jim Mora. Even so, the Bruins have managed 68 wins while dropping 61. Oregon has played UCLA only three times since 2011 and won each time. The Bruins played in the conference championship game in 2011 and ’12, and lost both times. Stanford has been on a great run in the last 10 years, with 93 wins and only 38 losses. Oregon is even with the Cardinal the last six years with a 3-3 record. USC is always good and very deep with talent every year. This explains their 94 wins and 37 losses. The Trojans’ record would probably be better if they hadn’t had to suffer through severe NCAA sanctions during this period. The Ducks and USC are even at two wins apiece over the last six years. Oregon had a very ugly season in 2016, ending with a 4-8 record. Even so, the Ducks stand at 102 wins with only 30 losses. Wow! That’s just incredible! Oregon has the best win-loss record in the Pac-12 over the last 10 years. Go back one more year and erase 2016 and the gap increases even more. More than 100 wins in 10 years is quite a feat for any team in the nation. Going back to the CRI and seeing that Oregon is NOT the big winner in recruiting each year makes you scratch your head and wonder. Defensive coordinator Jim Leavitt is making progress with the defense each day. Now, let’s look at how Oregon stacks up in the conference with recruiting. I dove into Rivals.com and got as much as I could, but it only goes back to 2003 in recruiting info. I’m not including the Huskies for this part, just the other four teams. Obviously, Stanford’s challenges with academic standards make it very difficult to stay competitive in their recruiting. Since 2003, Stanford’s average place in 10 and then 12 teams is 5.26. With the 2017 class of only 14 signees, the Cardinal still ranked No. 3 behind USC and Oregon, managing to rake in elite players. However, after signing the best class in their history in 2012, Stanford was able to get only 12 recruits the following year to rank No. 11 in the conference. Even with that one lousy class, the last 10-years’ average has improved to 4.4. Fourth-best in the Pac-12 in recruiting has been good enough for them to win three of the last five conference championship games. Prior to 2012, the Cardinal hadn’t won the conference outright since 1999. Oregon’s average conference recruiting class is almost exactly in fourth place (4.06) since 2003. For the last 10 years, the number bumps up to 3.7, just a little better than Stanford. In the span since 2003, the Ducks haven’t won the conference, only managing second place four times. However, Oregon has also played for two national titles since 2010 (losing both), and they are the only conference team to have played for the big one since USC lost to Texas after the 2005 season. The Trojans have averaged 1.2 since 2003 and 1.3 in the last 10 years in conference recruiting. The slight change was during the sanction years, when USC only placed No. 2 in Pac-12 recruiting classes. So, Southern California has had the No. 1 recruiting class in the Pac-10/12 since 2003 in all years but three (’12, ’13, ’16). 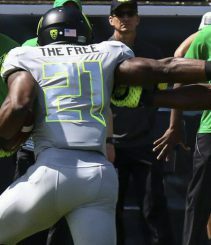 Royce Freeman was not a 5-star out of high school but his contributions have been equal to a 5-star. Now I really need more. Recruiting rankings and averages don’t give me enough of a meaningful measuring stick of why Oregon has been able to find recent success in the Pac-12. One measuring stick is how many 5-star recruits are hauled in each year. I tallied the 5-stars since 2003 for these four schools, and what I found was very interesting. Oregon has signed six 5-stars in that span, but hasn’t reeled one in since 2013. Stanford has two more, with eight. Three of them were brought in just this last cycle. UCLA has seen a few 5-stars — nine of them to be exact, according to Rivals.com. Just for fun, I’ll add those three numbers before I get to the Trojans. Six, eight and nine is a total of 23 5-star recruits. Well, the four years from ’03-’07 USC signed 24 5-stars! Whoa! That is just outright awesome! Oh, by the way, the total is 51 since 2003. This last cycle was the first time in this period that USC failed to sign a single 5-star, but they still had the top class in the conference. And they already have two committed for 2018. 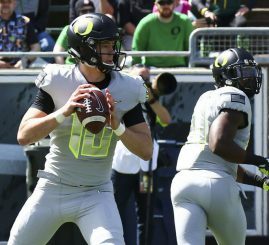 Projected staring quarterback Justin Herbert had a great showing in the spring game. That is a TON of talent swarming into LA to play for the second-best team in the conference in the last 10 years. Doesn’t it sting just a little bit to see the less talented teams of Stanford and Oregon getting the wins? For USC to finally play in the conference championship in 2015 and not win is amazing to me. Plus, what’s more amazing is that 2015 was their first chance at winning the conference since 2008. 2008?!? The top recruiting team in the Pac-12? Is that right? Yup! Absolutely right. The north division has owned the south since the Pacific 10 became the Pac-12 and needed a conference championship game to determine the champ. In the six games, Utah is the only south team not represented in the conference title matchups, while UCLA has two appearances. But why wouldn’t it be USC every time? With the gross abundance of talent on its roster year in and year out, I’d think it would be a guarantee! If history repeats itself, it will be easy to predict what will happen in the 2018 recruiting class. USC will again sign multiple 5-star guys and bring in the top class in the conference and possibly rank in the top five nationally again. Will it be a guarantee, however, that the Trojans will dominate the conference foes and win a conference title? Based on what history has taught me, the answer is no. 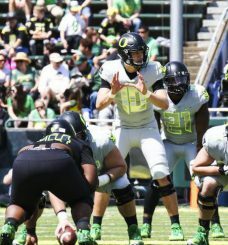 Ostrom mentions in his article that when Oregon recruits in the top 20 nationally, the talent is enough for the coaches to develop it into a top-five team nationally. In Willie Taggart‘s first two months, he signed a No. 19 class. In that time, he also signed a very enthusiastic, unreal, all-star squad of coaches who are amazing, energetic recruiters, eager to put Oregon back on the map of national title contention talk. Justin Herbert and Royce Freeman will run the offense , while D-lineman Jordon Scott gets his hand in the turf early as a freshman. 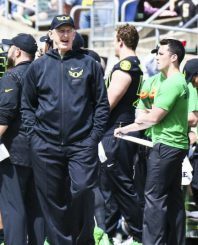 If the spring game in Autzen Stadium has any bearing on what the future for Oregon will be like, then let us recap the unofficial visitors that came in from all over the country in numbers like no other time in history. 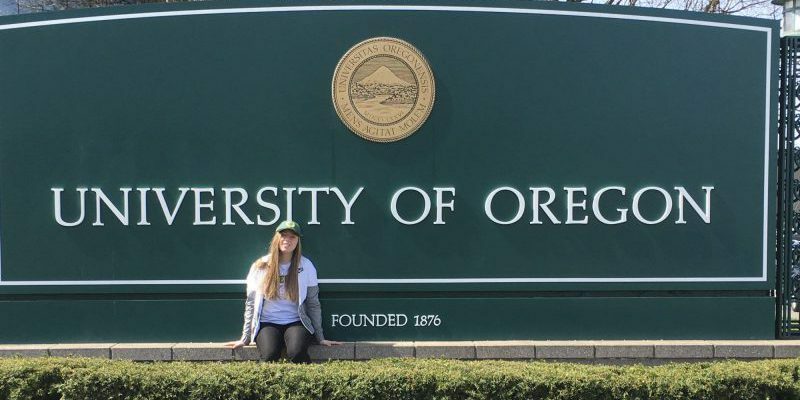 Most prospects left Eugene with a sense of optimism about what this program will become. A few highly recruited athletes wanted to commit the day of the game or after waiting a day or two. This is without any pressure from the coaching staff. Some left with newly acquired offers, and the rest left with something special to contemplate and a very tough decision to make in the future. The positive vibe has sent out a new buzz about Oregon. Even those not in attendance are taking a hard look at what is about to happen. The wheels are turning in my head in early May, and I hope I’ve caused some turning in each of your heads, too. If Taggart can continue recruiting like he did in only seven weeks’ time for the 2017 class and gain serious national attention with a Spring Game, then recruiting for 2018 will be great! It will be a top 15 class nationally, and No. 2 behind USC in the conference. The star-studded group of coaches will need to stay intact for several years and with that a shot at a National Title will return again as well. So, the next time you see several top-rated players select USC or UCLA over Oregon, you won’t know whether to feel sorry for them or just laugh about the mistake they’re making. History tells us that Oregon is likely to prove to be the better team in the long run.